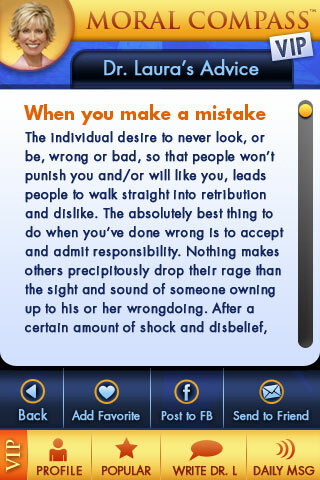 Dr. Laura's Moral Compass brings the advice of Dr. Laura to your iPhone or iPad. Filled with features, the Moral Compass is the app Dr. Laura fans have been waiting for. Search by keywords or browse through listener's questions about love, marriage, motherhood and more. Read Dr. Laura's advice for each and find the answers you want. The Moral Compass has been written exclusively for your questions and is not just a index of soundbytes. Designed with you in mind, the Moral Compass app will be updated every month, adding new advice and new features. Requirements: Compatible with iPhone, iPad and iPod touch. Requires iPhone OS 3.2 or later. Internet connection recommended. ***** Very thankful - Been a listener for years and very happy that this has come out! I love the search for her advice. Spin compass was very fun. Thanks! *** Cute but needs some tuning - Love Dr Laua. The app is cute. Her advice on various caller topics is concise and on par with what you'd hear on her show. I love that you can separately save your favorite advice for easy reference. [special thanks to this reviewer for her functionality advice - DrL App Team]. We want to hear from you. Please don't hesitate to contact us at email us with questions or feedback. You can also visit this site for up to date information on versions and upcoming features. Updates will always be free through the App Store. What operating system should I be using? The Dr. Laura app is optimized for OS 4.2.1 and we recommend that all users do the free upgrade to this version. There is a known bug for OS 3.2 users on the iPad. This will be addressed in the next version being reviewed now. This bug does not occur if you update your iPad to 4.2. To update your device, connect it to iTunes and click on the "Check for Update" button under Summary when you select your device in the menu. How often is the advice updated? Every month, new advice will be added in the app updates. Dr. Laura has answered hundreds of thousands of questions and our team is working diligently to provide the most relevant and important advice. If you have questions that you'd like to see included, please email us. We will do our best to make it happen. Absolutely not. Your privacy is extremely important to us. The information you enter on the profile in the VIP version never leaves your device and is not shared, even with us. It is used to help provided a more personalized list of advice, to make it easier for you to find the advice that matters most to you. 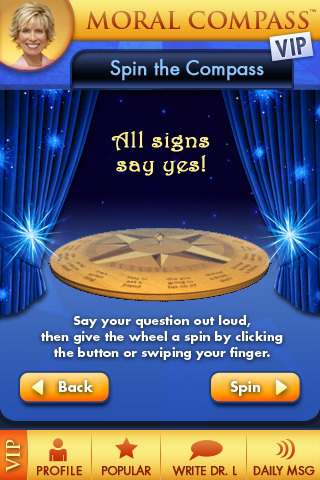 The Moral Compass is the first of Dr. Laura's apps. Bringing her advice to your mobile device, the Moral Compass is the only official app for Dr. Laura. Advice in the app is direct from Dr. Laura and addresses questions that you may have about life, love, marriage, family and more. Two versions of the app are available - Basic, which is free - and VIP which is $1.99 with many additional features. Dr. Laura's Moral Compass is part of the new move to the online and mobile world for Dr. Laura in conjunction with her upcoming move to Sirius radio. Listeners can now get monthly updated advice to carry with them wherever they go while staying current with Dr. Laura's facebook, twitter and rss notes. This app is very much a creation of the listeners with features being created based on user feedback and thoughts. 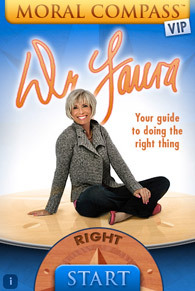 We welcome all constructive ideas and hope you enjoy Dr. Laura's Moral Compass. 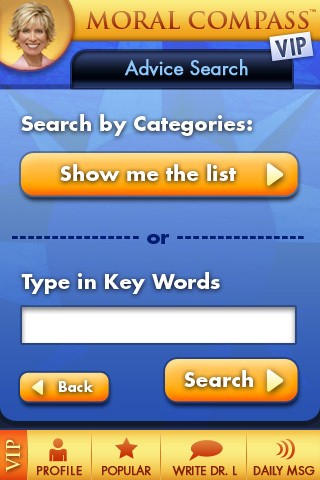 Our goal with this app is to bring the most important features to the iPhone for Dr. Laura's listeners. Your feedback is crucial to helping us make the best possible app. Updates will happen on a very regular basis with your notes and ideas coming to life. Each review and email to our support email is read by our team and we strive to respond to every single one. Please let us know what you think. Spread the word. And do the right thing. Thanks! You speak, we listen! Please keep the feedback coming. We want to hear from you. Each email is personally reach and we will attempt to respond to each one received. Thank you for helping us make the best possible app! Copyright © 2010 Poets Mobile / Take on the Day. All Rights Reserved.